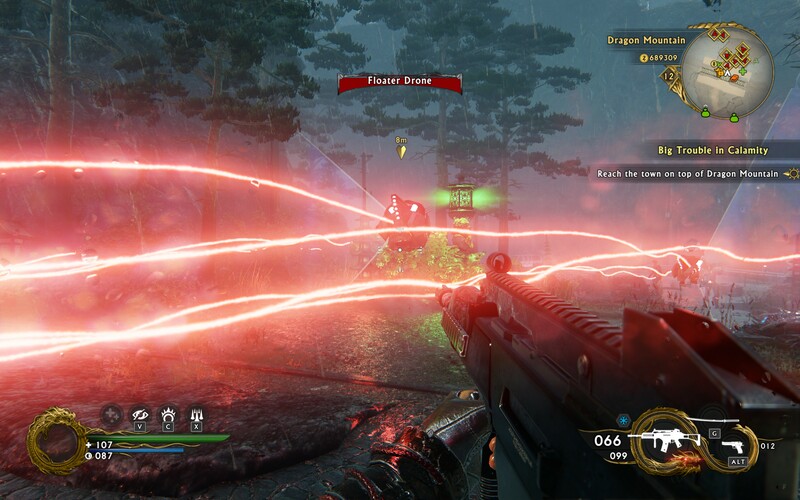 I’ve been playing Shadow Warrior 2 for a week now and it’s pretty good fun, though quite different to the original. 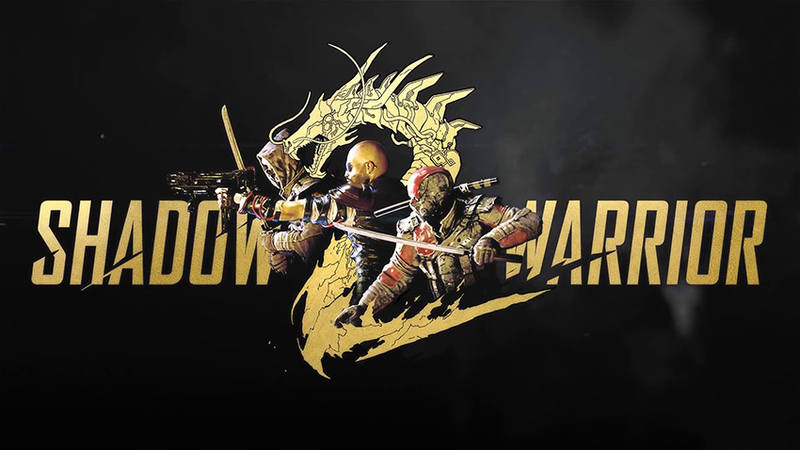 Bit more detail below 🙂 Shadow Warrior 2 is the sequel to the 2013 remake of the original Shadow Warrior. I played the original 1997 version and it was ok but the remake was great; it managed to keep the original humour while being a really good action game at the same time. I thought the story was pretty good as well (as it progressed) though really it boiled down to a thinly-veiled excuse to dice everyone up with a katana. It was popular, good and successful (you don’t get all three that often) but instead of doing more of the same the developers changed things radically for the sequel. 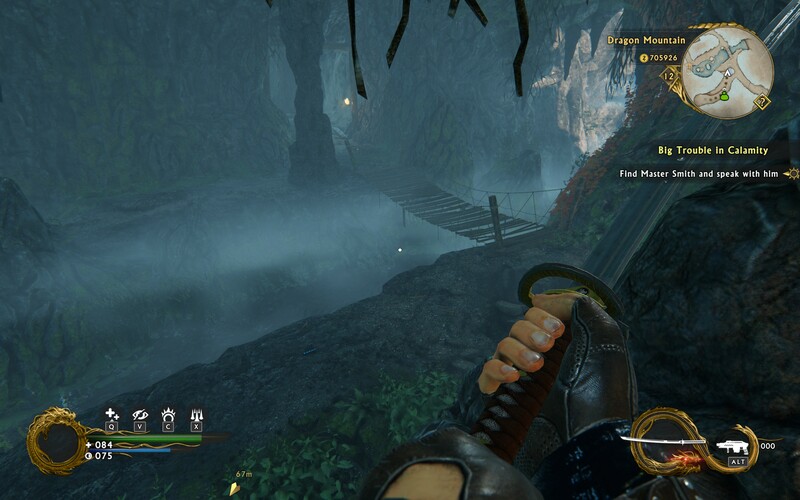 In place of a purely single-player experience they built it from the ground-up to be co-op compatible AND replayable. That means the levels have a hand-crafted core with lots of procedurally-generated parts around and through it. Additionally they stuffed the game full of randomised loot so you’ve got a reason to replay it on your own or with friends (and the replays should be different depending on what guns and mods you use). When these changes were announced there was concern that it would make the game bland or a meaningless grind just to get better guns. I enjoyed Borderlands 1 and 2 (which had a similar idea) but the combat was always more MMO than FPS so the worry was pretty justified. How the story is integrated into the game is a little disjointed now (due to it having to work when there’s 4 players in the game) but in reality it’s not a big deal; the story plays out as well enough and it doesn’t get in the way of the main point of the game: Mindless Extreme Carnage. The devs banked on the fact that you wouldn’t mind the occasional repetitive or bland piece of random level design as the combat would be so much fun. They were correct too; the combat is great. 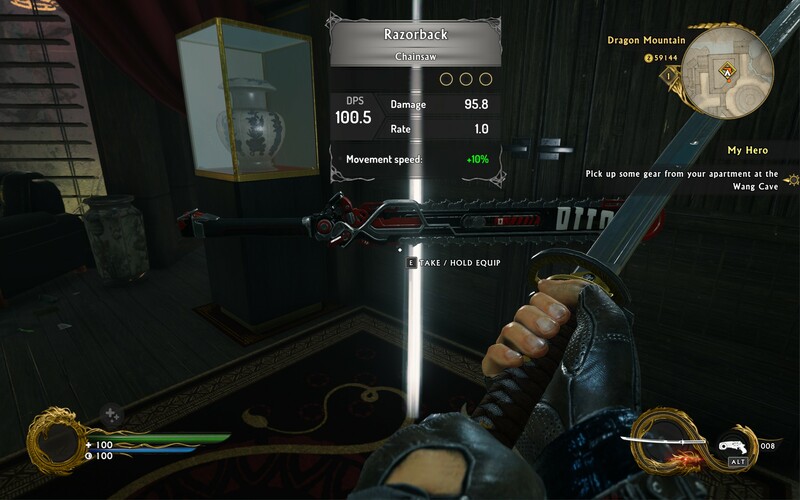 The whole range of weapons I’ve seen (there are 70 or so in the game) work well and mean you have to mix up your gameplay depending on the enemies (I’m playing on Hard). On the other hand you can barrel in with any of them and feel like a total death-machine too. 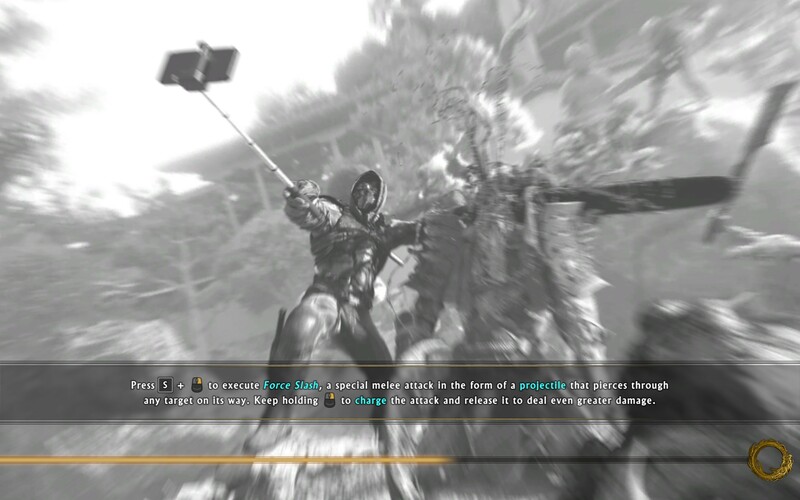 So while you have to be a little careful with some elite monsters on the harder difficulties, there’s plenty of opportunity to jump into the middle of a group of ninjas and chop them up with a chainsaw-katana (yes, really). You get double-jump and dash straight away too and neither of them is limited (no stamina); you’re constantly ninja-ing it up as you wheel around the combat zone, insta-switching weapons and blowing stuff up. The loot system is mostly fun as well. 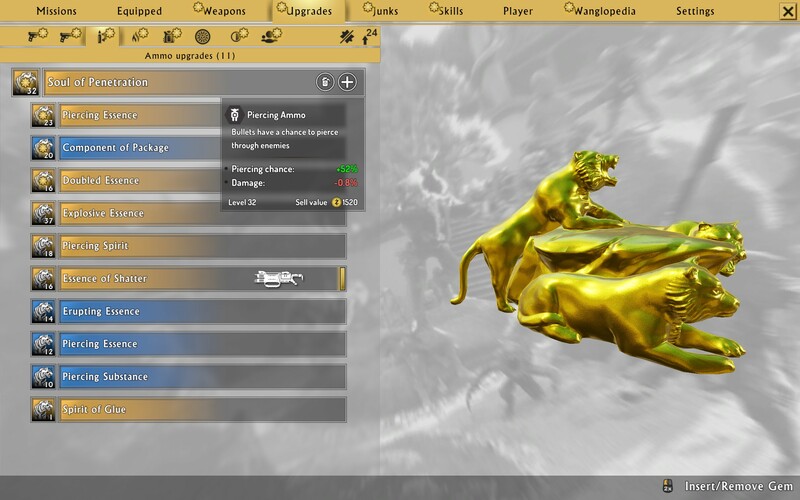 In addition to the multitude of guns there are loads of gems you can slot into weapons and armour. Lots are fairly bland damage or stat buffs unfortunately but there’s quite a few that radically change how the guns work; turning one into a turret, making it’s projectiles split or explode, adding elemental effects etc. You’ve got a slot that’s only active when you play co-op too so you can have a range of cool buffs from each person in the game. If you really wanted to min-max it’d be a chore wading through all the chaff but I didn’t bother; I dump all the boring stuff and just cherry pick a few interesting items. It works well enough on Hard even with my geriatric reactions. 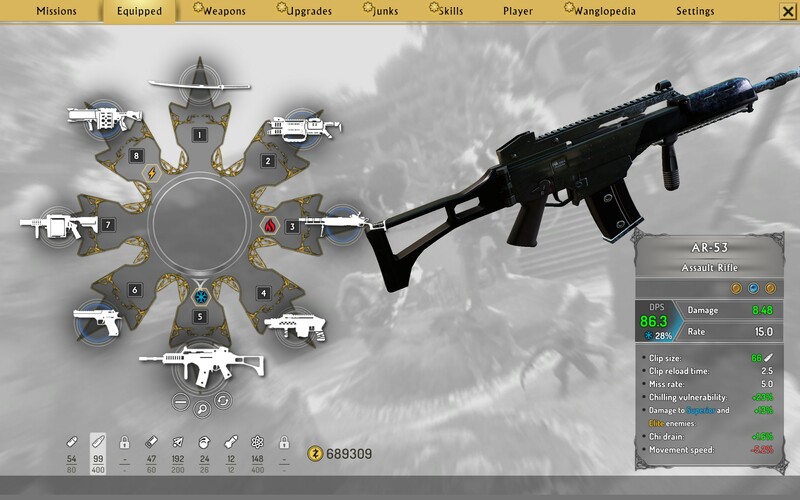 All the options allow you to customise both your loadout and character (there’s levelling and a skill tree) to however you feel like playing. Life-drain melee? Piercing sniper? Heavy magic crowd-control? Whatever you want. Respeccing and swapping gems is easy and essentially penalty-free(respeccing your skills costs a little bit of money but I was swimming in cash after the first level). It looks spectacular (in a colourful rather than realistic way) and some of the set-pieces have been very cool indeed. 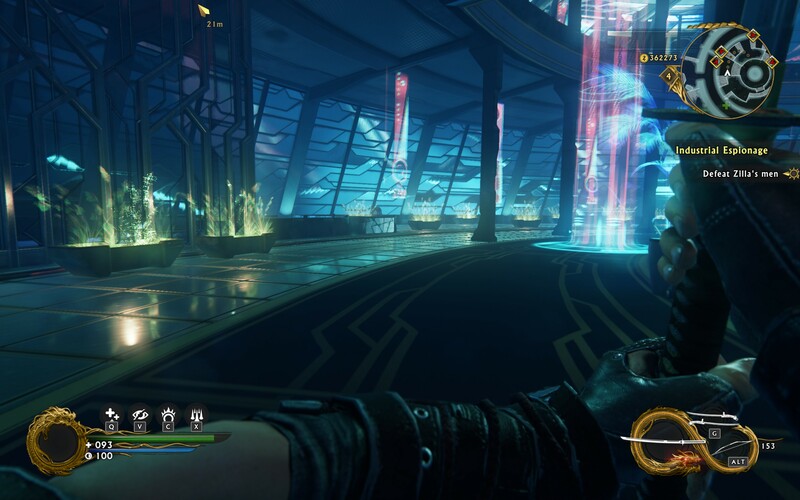 There’s loads of space and you have the run of the whole level while fighting; I’ve had a few awesome fights where more and more creatures swarm me as I leap across buildings or sprint through forests, fighting as I go. It plays very differently to Doom (another recent, awesome, fast-paced FPS) due to the speed of movement and the lack of “Arena-style” fights. I’m glad I bought it; the single-player is fun (I’ve been dropping back into old levels when I’ve got 10 minutes for a quick bought of mass-destruction) and I can’t wait to play it co-op. And Lo Wang makes me laugh; occasionally in an eye-rolling, cringey way but at least I’m laughing.